The Precision 185 expands on the broad appeal of her smaller sister by adding an extra dose of acceleration and speed to her performance profile. The 'big daysailor' type is still probably best defined by the Lightning, Rhodes 19 and Flying Scott, all old favorites introduced nearly forty years ago. There has not been a great deal of innovation and development in this market for some time, and various new offerings have come and gone without making much of an impact. The Precision 185 will make her mark by using true state-of-the-art design and construction technology to combine vastly improved ergonomics and higher performance with low weight, low maintenance, and low cost. 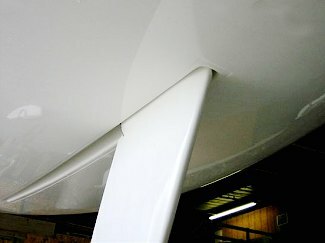 Comfortable seating, computer-shaped hull and fins, and precise tooling will all contribute to the appeal of this 'new century' competitor. 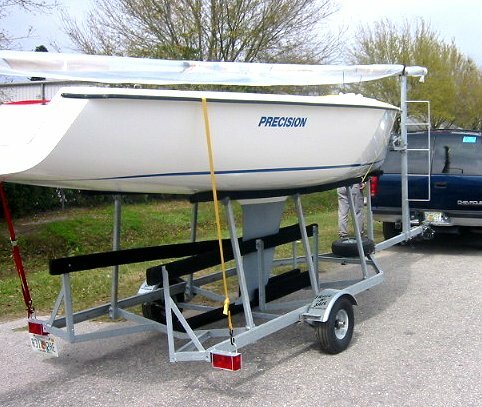 Like her smaller sister, the Precision 185 features a large, self-draining cockpit, a secure spot for a portable ice chest, practical under-deck storage, straightforward rigging, and high quality hardware. Her swim platform at the transom is an unusual feature usually reserved for large offshore cruisers. 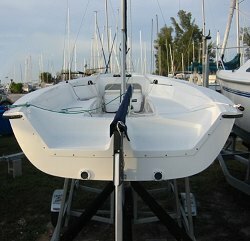 In addition to contributing to the fun by getting swimmers back aboard more easily and allowing youngsters to trail their toes in water, this 'back porch' can contribute to safety by facilitating boarding from a dinghy, and recovering from an accidental 'man overboard' incident more easily and quickly. 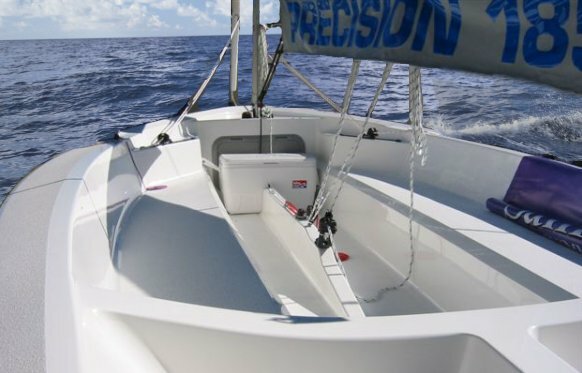 The performance parameters of the Precision 185 are not intended to put her in the realm of a 'crash and burn' Australian 18 skiff, but they will give her the kind of acceleration and speed that will turn heads and quicken the pulse when desired. 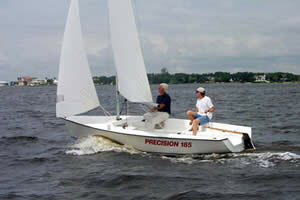 (Center Board Up) - 0'6"
(Center Board Down) - 4'10"
Mast Height Above Water Line - 27'3"